Installing the TED 5000 to monitor your electricity use is easy and it does not require you to tinker with your mains cables- but does require to clamp the meters around those cables. 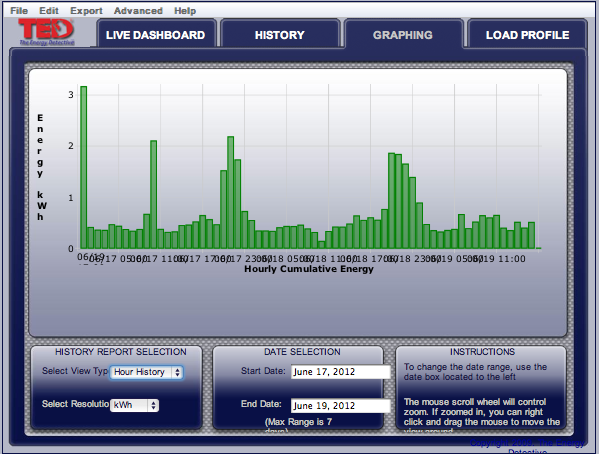 Read here how I use it in conjunction with Kill-A-Watt EZ to understand and improve electricity use. I have experience working with high-power electric installations so it was a snap to do for me and I am familiar with safety and electricity. The foundation of the TED5000 is two clamp-ammeters that measure the current flowing through the main cables powering your house. They can measure this without touching the circuit by measuring the electromagnetic induction inflicted on a ring caused by the alternating current in the cables. The “clamps” are rings that you can open and close around the cable without having to touch it. You use two clamps as most likely your house receives electricity via two AC ‘phases’ Then, the TED5000 MTU connects to a breaker on each ‘Phase’ directly, and to the neutral bar, so it can measure voltage. It multiplies voltage and current, to get a power reading. The MTU has 3 other cables: one goes to neutral, and other two that need to be connected to a line of each phase. This allows it to measure the voltage, as well as transmit data out via a signal sent over the power line. A “gateway” box plugs in to an outlet on the same phase as the signal cable, which reads the data and has a computer network ethernet port to share the information out. Here are some tips to set it up. Some are common sense and others are from experience. Needless to say be careful, think ahead and rehearse mentally when you are doing something you are not familiar with. Preparation is important: make sure you read the TED 5000 installation guide and you understand what to expect inside your main box. You should cut power to the mains. Rehearse the operation mentally and have nearby some screwdrivers, labeling material. I used some insulating tape to tidy up the cable layout too. Screw in cables firmly but not so tight you can damage the ends. Consider the way screws turn so that they clamp around a cable inwards and not ‘eject’ it when tightening them. Be tidy about the cable layouts. Don’t stretch, tense, or force things in places they don’t want to go. Label the switches you connect your TED leads to. If you turn those off, the MTU will stop sending data to the gateway, which will continue to give you a false ‘steady’ reading, and it may confuse you if you are measuring as you flip switches on and off. Make sure you connect the data line to a breaker that has outlets nearby! Choose a nearby outlet before starting. Don’t leave the MTU dangling from the cables, squeezed against a door or panels. Again, be tidy. Check things before closing up. Don’t leave tools inside. Give a shout out when powering on and off. 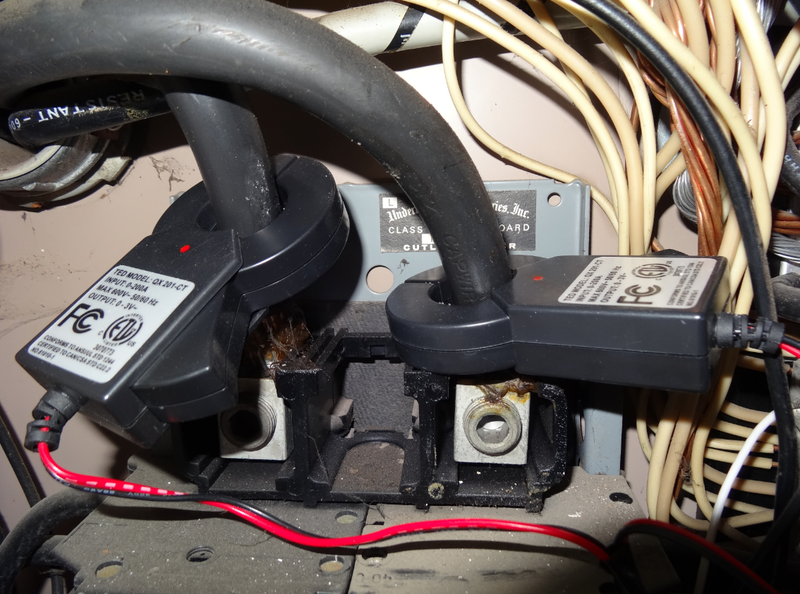 Make sure a well-meaning soul won’t turn on the mains while you are working. The Gateway is just a little device you plug in to an outlet. Since it communicates with the MTU via power line communication you need to plug it into an outlet controlled by the breaker switch you chose to install your MTU communication line in the mains box. It can be frustrating if you don’t get a signal at first. I had to try on two different outlets until I got a strong reliable signal. The closer it is to the mains (physically) the better as the power line communication degrades with distance. This can be challenging as usually the mains is in a basement or somewhere far from ethernet cables. Once it’s set up you can use the TED5000 web interface or one of many smartphone apps (I list mine here) to look at the data. You need to discover the IP address of the TED device. I happen to be handy around network configurations so it was easy for me, but the TED 5000 materials give you clear instructions to follow and helper applications to do it yourself. If you buy the TED 5000 from a store it’s likely you’ll get the kit which includes a portable display you can use anywhere in the house. I don’t have one so I can’t review it or give you tips about using it. I also chose to expose the IP address of the TED 5000 on the internet so I can access the information directly anywhere with a connection.